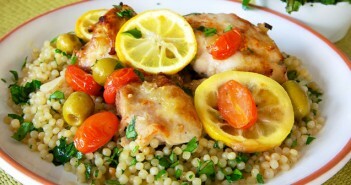 This is a great tasty healthy recipe that works well for children too. While the rice is cooking make the chicken balls. Finely chop the parsley then mix together with 2 garlic cloves crushed, 4 tbsp breadcrumbs, zest of the lemon, ½ the juice of the lemon, 1 tbsp of Greek yoghurt and a good pinch of salt (1 tsp flat) and pepper. Blend the chicken in a blender (should be roughly minced), stir in the parsley and breadcrumbs then using your hands mix together well. Using a desert spoon take the mixture and form into balls (size of golf balls). Set aside on a plate. In a medium sized saucepan bring to the boil the chicken stock and add the chicken balls, simmer for 8 minutes. Drain off the stock and keep to one side. Melt the butter then add the flour and stir well to make a paste, slowly add the milk and then 300ml of the chicken stock, the juice of ½ the lemon, salt and pepper and the remaining parsley. Stir well and simmer for 3 minutes then add the rest of the Greek yoghurt and the chicken balls. While the sauce is simmering cook the peas. Add the chicken balls to the sauce and stir. 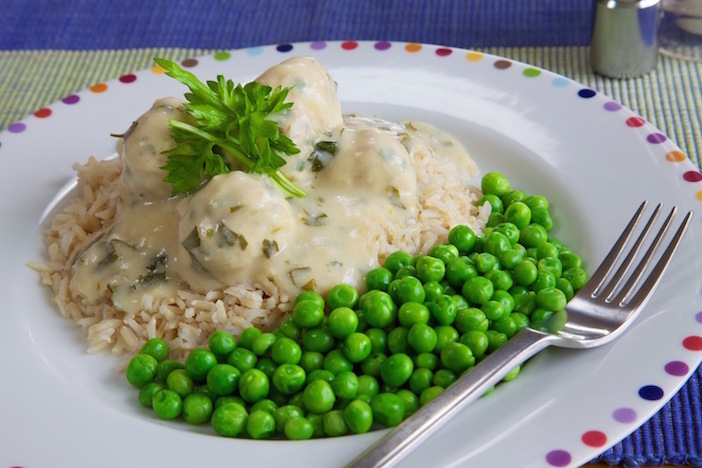 Serve on top of the rice with the peas.